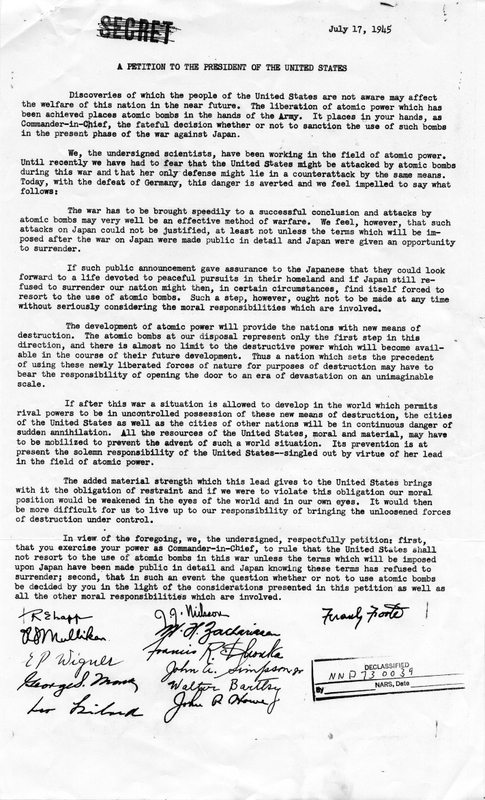 Leo Szilard drafted the petition below to the President in the summer of 1945 attempting to avert the U.S.'s use of the atomic bomb against Japan. Although the petition was signed by seventy other scientists of the Met Lab in Chicago, it was never seen by the President or the Secretary of War before the first atomic bomb was dropped on Hiroshima. Discoveries of which the people of the United States are not aware may affect the welfare of this nation in the near future. The liberation of the atomic power which has been achieved places atomic bombs in the hands of the Army. It places in your hands, as Commander-in-Chief, the fateful decision whether or not to sanction the use of such bombs in the present phase of the war against Japan. The war has to be brought speedily to a successful conclusion and attacks by atomic bombs may very well be an effective method of warfare. We feel, however, that such attacks on Japan could not be justified, at least not until the terms which will be imposed after the war on Japan were made public in detail and Japan were given an opportunity to surrender. If such public announcement gave assurance to the Japanese that they could look forward to a life devoted to peaceful pursuit in their homeland and if Japan still refused to surrender, our nation might then, in certain circumstances, find itself forced to resort to the use of atomic bombs. Such a step, however, ought not to be made at any time without seriously considering the moral responsibilities which are involved. The development of atomic power will provide the nations with new means of destruction. The atomic bombs at our disposal represent only the first step in this direction, and there is almost no limit to the destructive power which will become available in the course of their future development. Thus a nation which sets the precedent of using these newly liberated forces of nature for purposes of destruction may have to bear the responsibility of opening the door to an era of devastation on an unimaginable scale. If after the war a situation is allowed to develop in the world which permits rival powers to be in uncontrolled possession of these new means of destruction, the cities of the United States as well as the cities of other nations will be in continuous danger of sudden annihilation. All the resources of the United States, moral and material, may have to be mobilized to prevent the advent of such a world situation. Its prevention is at present the solemn responsibility of the United States—singled out by virtue of her lead in the field of atomic power. In view of the foregoing, we, the undersigned, respectfully petition: first, that you exercise your power as Commander-in-Chief, to rule that the United States shall not resort to the use of atomic bombs in this war unless the terms which will be imposed upon Japan have been made public in detail and Japan knowing these terms has refused to surrender; second, that in such an event the question whether or not to use atomic bombs be decided by you in the light of the consideration presented in this petition as well as all the other moral responsibilities which are involved. Larned B. Asprey, Junior Chemist, S.E.D. D. C. Stewart, S/Sgt S.E.D. The Szilard Petition. The Szilard Petition. Photo courtesy of the Harry S Truman Library. 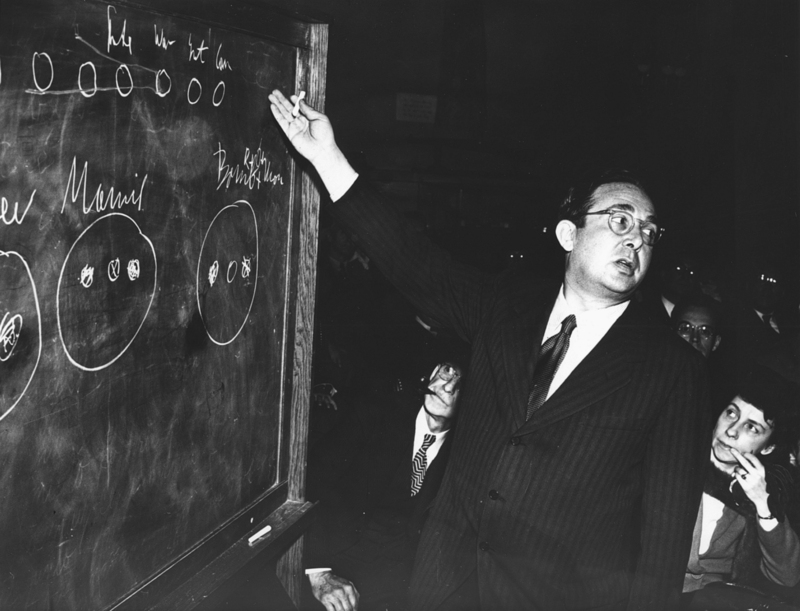 Alex Wellerstein, Were there alternatives to the atomic bombings?